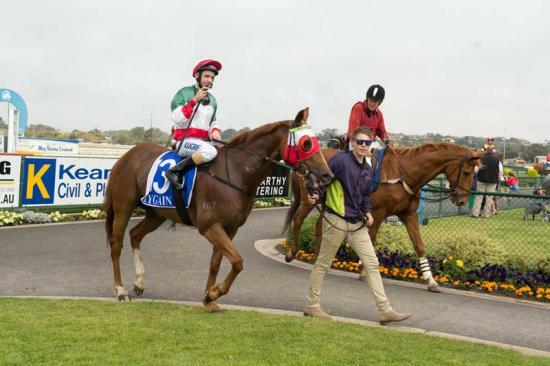 Youbolt defied a distance doubt and 28 months out of the winner’s stall to score a gutsy victory in the $40,000 Port Fairy IGA Cup at Warrnambool yesterday. Bolt was beautifully ridden by claiming apprentice Beau Mertens giving the son of champion jockey Peter Mertens his 10th career win and his biggest highlight so far. On the home turn Bolt hit the front and all the way up the straight they couldn't overtake him with the margin being 0.3 lengths. The well travelled Bolt has recorded victories in the Northen Territory, Tasmania and Victoria and placings in South Australia. This home town victory was a lovely result for the Stable team.